DOST Online Degree Admissions Schedule, Registration Process 2019/ DOST Online Degree Admissions 2019: Degree Online Admissions through DOST, Degree Online Services Telangana DOST Online UG Admissions, DOST Degree Admissions. Online Degree Admissions Committee has decided to give a notification on May 8 for Online Degree Admissions for 2019-2020 and a Tentative schedule has been prepared for this admissions. Online Degree Admissions schedule to be announced on May 15 and online applications along with web options will be received from the eligible candidates from May 10 to 25. First phase seats allotment should be announced on June 06. CCE and SPD Telangana has constituted the Project Monitoring Unit (PMU), Core Committees, Centre for Good Governance (CGG) and Help Line Centres for DOST Online Degree Admissions. Applications are invited through online mode for registration and admissions into various Undergraduate Courses, such as B.A., B.Com., B.Sc., B.B.A., etc., offered by various colleges affiliated to Osmania University, Kakatiya University, Telangana University, Mahatma Gandhi University, Satavahana University and Palamuru University which includes Constituent, Government, Aided, Autonomous and Private Colleges for the Academic Year 2018- 2018. The candidates who have passed Intermediate Examination of Board of Intermediate Education, Telangana State or any equivalent recognized examination from other boards/states are eligible to apply. One time registration fee for applying to the university/colleges/courses is Rs.100/- (one hundred only), which can be paid through Credit Card / Debit Card / Net Banking. Only one online registration is sufficient for all the colleges/courses of one or more Universities. For online application and for further details, visit the domain, http://dost.cgg.gov.in The respective Universities are responsible for the admission under their jurisdiction. The State of Telangana is going for Online Admissions for the second time in 2019. Telangana State Council of Higher Education has taken the responsibility of executing the process. Prof. K. Venkata Chalam, Vice Chairman 1 is the Convener of DOST (Degree Online Services, Telangana). The main objective of the Government of Telangana is to give access to quality of education and equity in education to all students of Telangana State. This is made possible through DOST which ensures transparency. The excellent services that are extended through DOST will certainly make the students satisfied in all aspects with regard to their admissions into Degree Colleges. The Online Service, DOST, brings all Government Colleges, Autonomous Colleges, Private Colleges and Aided Colleges under one umbrella giving the students a wide range of Colleges and Courses to choose. The Online access of all the colleges to the students facilitates him/her to approach the colleges and universities without rushing from place to place physically. He/she will have enough time to make choices from their own desk. The decision of the Government to charge only Rs 100/- from each registration, across the universities and colleges will be a financial benefit to the students. It is onetime payment of Rs 100/- and the student can choose any number of colleges and courses in any university and in any phase, in case he/she decides to go for sliding. All precautions are taken by the Convener, DOST, Prof. K. Venkata Chalam, to run the programme smoothly without any confusion. The process begins with the biometric authentication by the student at any eseva/meseva by submitting the proof of his/her Hall Ticket number of Board of Intermediate, valid phone number, his/her Aadhaar Card number. After receiving the unique ID/Token Number, the students has to take a print out and approach any system with internet facility for registering his/her Application Form. With the help of the token number, the student registers his name by paying Rs 100/- to the account of the Convener, DOST, with the help of IFSC Code Number and Bank Account Number (the student has to complete his/her Registration Process from the Website, dost.cgg.gov.in). The payment can be made by any debit card/credit card of any nationalized bank. All other details can be noted by logging on to the Website. This process is aimed to minimize the physical and financial burden and mental stress of both students and parents. After completing the registration process the student will receive an Application Number. Then, he/she should fill in the Application Form. Many of the fields are auto-filled for the Board of Intermediate, Telangana State candidates. The latest Caste and Income Certificates of April 2018 have to be uploaded if the student is opting for a seat under reservation. The student can opt for any number of courses any number of colleges and in any university under Telangana State. Allotment details are informed to the candidate and to the concerned college Principals via SMS. The allotment letters will be sent to the respective students which he can download from the website. Students should approach the concerned Principles for verification of certificates. The concerned Principal will verify the required certificates and confirm the seat of the student. In case of the candidates who are not satisfied with the allotment of a seat given in the first phase and who desire to choose a different one can again give their web options in second or third phases. But they will lose their earlier allotted seat in case they are allotted a new seat. However, the student who is interested in continuing with the allotted seat need not go for sliding. For candidates, those who are not students of Board of Intermediate, Telangana State, and belong to other States should get their certificates verified manually at Help Line Centres of Government Colleges and University Help Line Centres and then go for the registration. They should first fill up the Application Form and go for Web Options processes. Then again they have to visit any Help Line Centre of Government Colleges or University Help Line Centres or Eseva Centers to verify and complete Biometric Authentication processes. 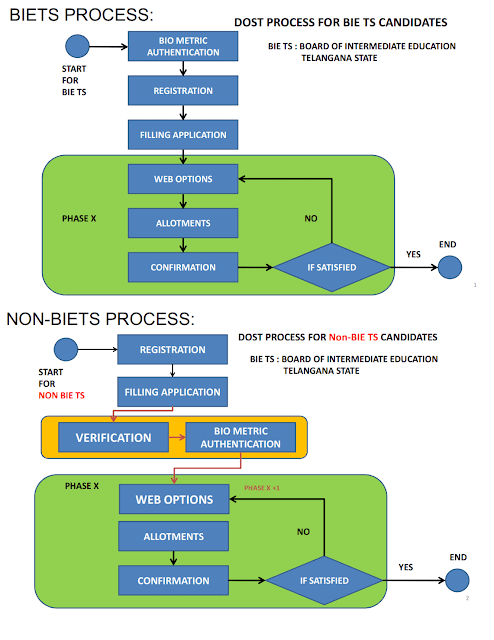 It is only then that such candidates are eligible for allotment and confirmation processes. ~ Online Submission of forms through DOST from May 10 to 28. Aadhaar and biometric details must for submitting application online. The process of admission into undergraduate courses offered by Satavahana University in its 123 degree colleges, including government and private colleges, through Degree Online Services, Telangana (DOST) would begin on May 18 in all districts. Students can log in to dost.cgg.gov.in for submitting their application for degree colleges under Satavahana University and also other universities in the State. To provide proper guidance to students, SU has set up eight help desks in various degree colleges and also on the university campus in the district. In a first, Aadhaar card would be accepted and biometric system would be introduced for submitting the online application. Applications should be submitted online and web options exercised from May 10 to 26. The same can be done from June 27 to 29 with a late fee of Rs. 400. The first list of seat allotment would be announced on June 04 and students should report to their respective colleges from June 05 to 06. The second phase of web options would be announced from June 13 to 14 while the second phase of seat allotment would be done on June 19. Students should report to their respective colleges from June 20 to 25. The last phase of web options should be exercised from June 26 to 27. The final list of seat allotment would be announced on June 30 and students should report to the colleges from July 02 to 04. First semester classes would begin from July 02. 2.A Valid Registered Mobile Number(RMN). 3.Aadhaar Number of the Applicant (ANA) only. 1. DOST Application Number, 2, 3 of the above plus Verification Number (VN). DOST News: Students seeking admissions into degree colleges through Degree Online Service of Telangana (DOST) are facing problems in completing the admission forms because of mandatory biometric registrations imposed by the government. The biometric registrations are time consuming and hence the students are forced to spend extra time at authorised centres for the completion of biometric registrations. According to the new rules, students getting admissions through DOST should successfully complete their intermediate and then register their fingerprints at the Mee Seva centres through a biometric system by submitting their intermediate pass certificate and Aadhaar number. They would then get a token number which would give them access to the website for online application process. However, registering fingerprints through the biometric system in the Mee Seva Centres is consuming lot of time, the students said. As the Mee Seva centres are falling short for lakhs of students they are facing troubles in completing the process without wasting time. There are about 3 lakh seats in the government and private degree colleges in the first year and about 3.5 lakh students are there in the State seeking admissions into degree colleges. According to the schedule, the online admission process through the DOST will be available only till May 26. The admission process was started May 18. The Mee Seva centres are the only authorised centres for biometric registrations and the students are flocking in thousands to get complete the process.